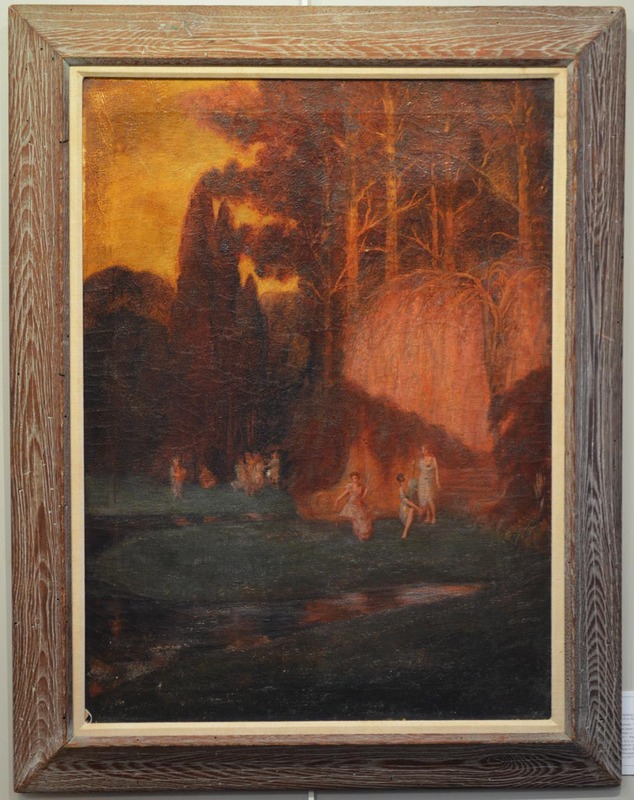 This is a very rare engraving by American artist J. Alden Weir. 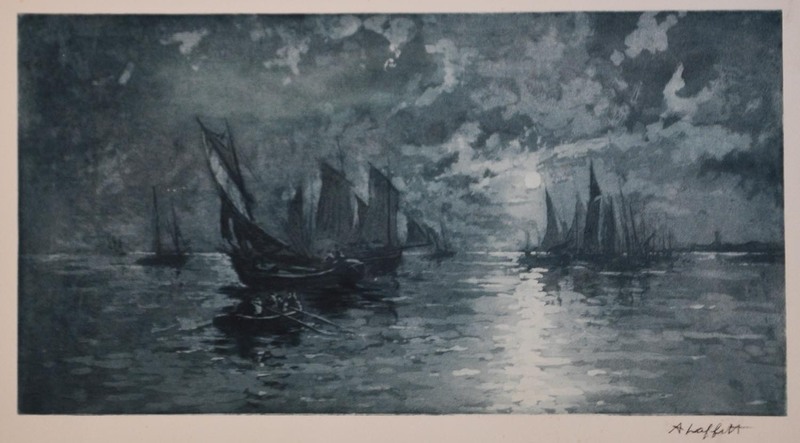 The title is: "Arcturus", it was created and printed in 1893 and is the result of his visit to the Isle of Man in 1889. 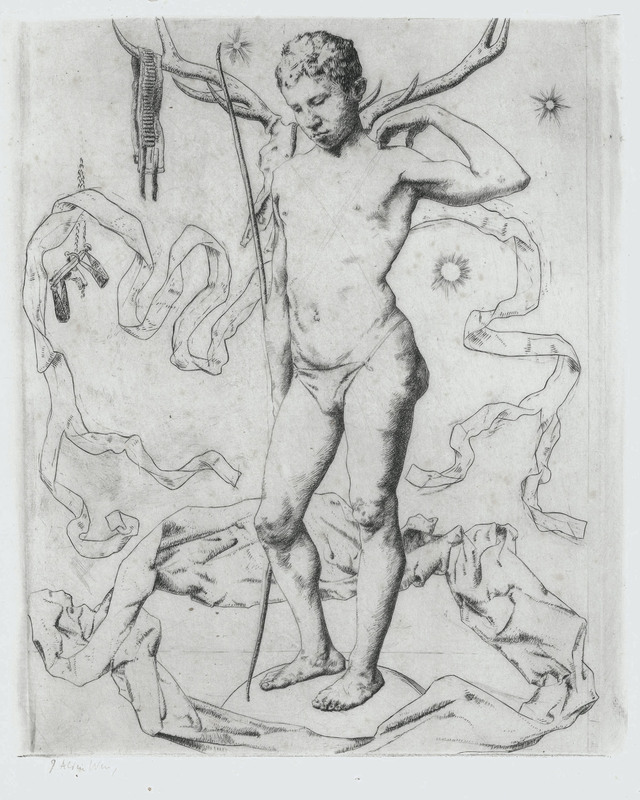 It shows a young boy with the accoutrements of the Hunt all around him. The engraving is hand signed in pencil lower left border. Printed on a "G&O" watermarked laid thin type paper. The image measures 8 7/8X7 1/4 inches. According to research this was his only engraved image. 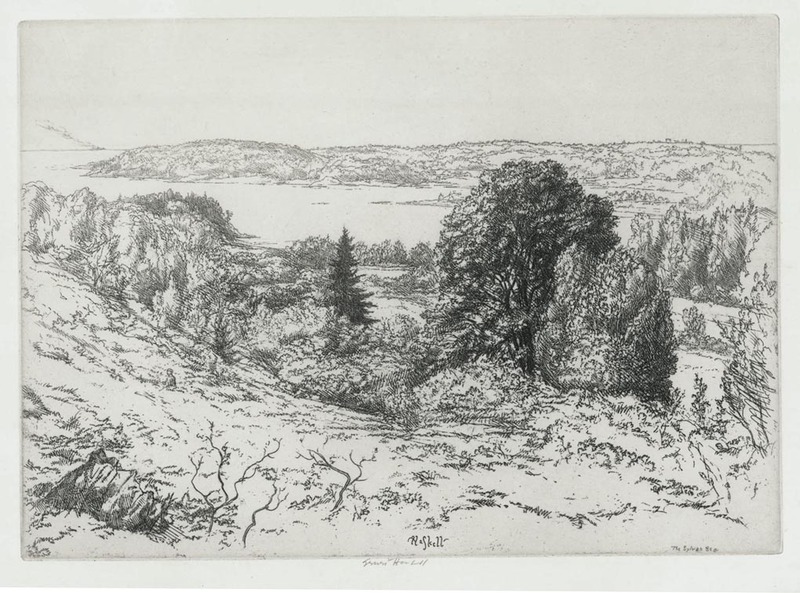 This is a drypoint etching by J. Alden Weir. 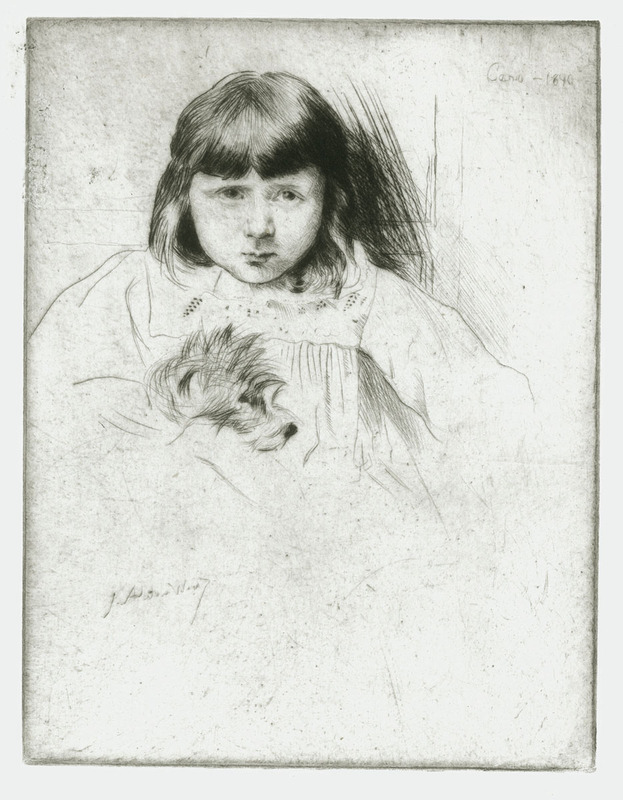 It is a portrait of his daughter Caroline, "Caro" and her dog Gyp. This etching was created and printed in 1890. The image measures 7 3/4X5 7/8 inches. It is signed in the plate only and titled and dated in the upper right edge of the image. Printed on a thin watermarked laid type paper. 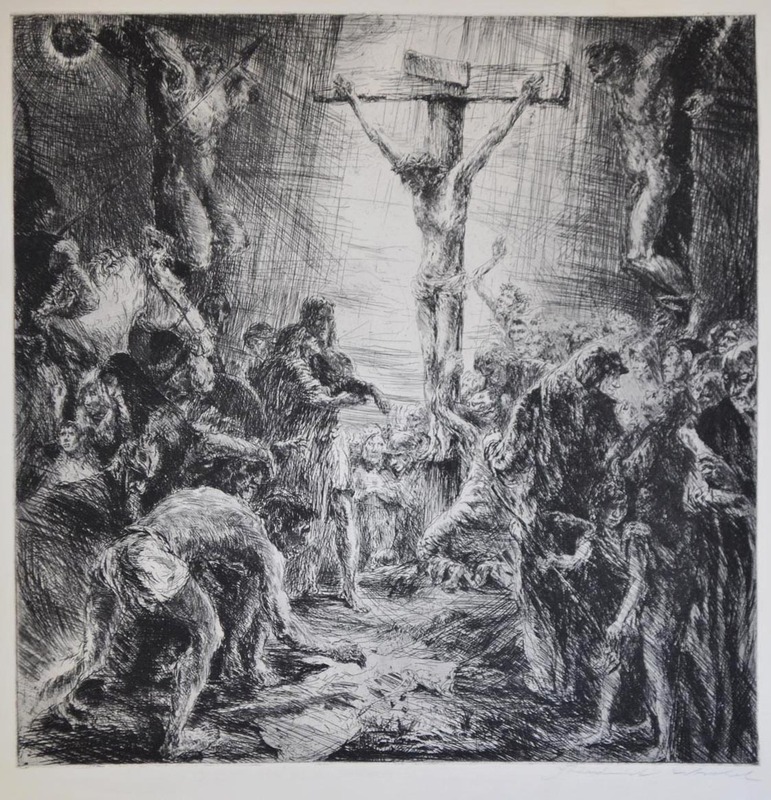 This is an original pencil signed study of the Crucifixion . We are unsure who the artist was, It appears to be Ferdinand ....? The image measures 15 3/4X15 1/2 inches. It appears to be early 20th century, printed on a medium weight wove type paper. Very richly inked. This is an original wood engraving by American artist Kay Peterson. 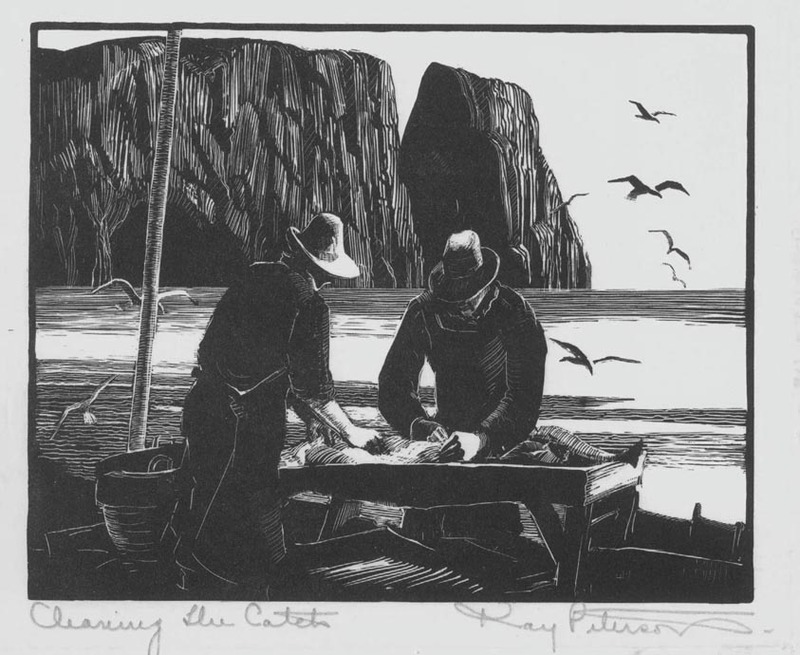 The title of this work is: "Cleaning the Catch", created and printed c.1930's. This wood engraving is hand signed and titled in pencil. The image measures 4X5 inches. Thsi is an original wood engraving by Hoyland Bettinger. 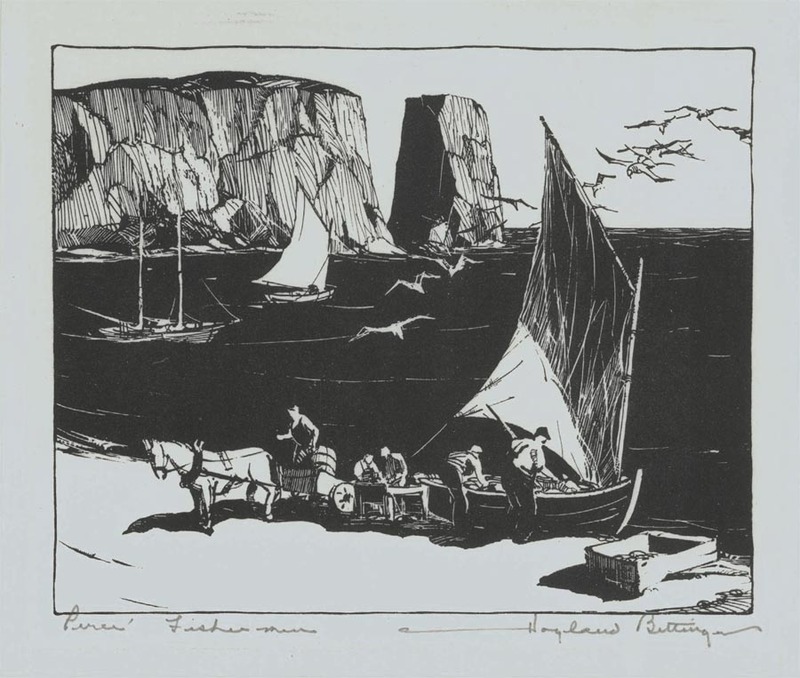 It is titled: "Perce Fishermen", created and printed c.1930's this image is pencil signed and titled in the lower border. The image measures 4X5 inches. 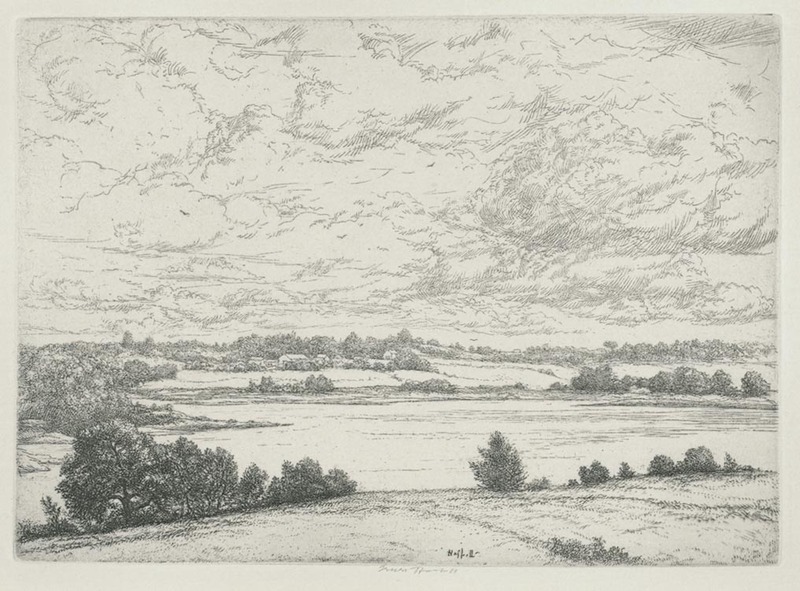 This is an original pencil signed etching by American artist Ernest Haskell. 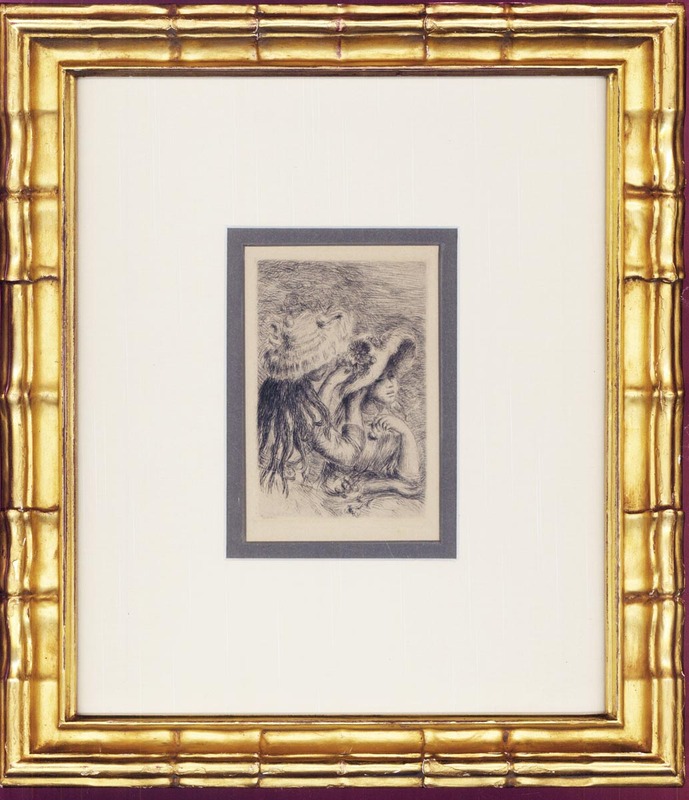 The title of this work is: "The Sylvan Sea", created circa 1930 this etching has an image size of 5 3/4X8 1/2 inches. Printed on a light weight wove type paper. 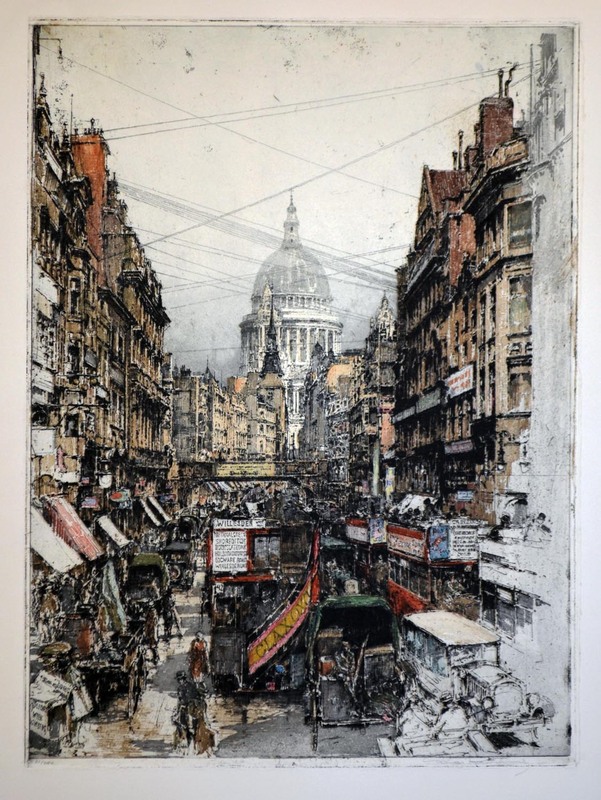 This is an original pencil signed lithograph by American artist Emil Ganso. The title of this work is "Two Sisters", it has an image size of 16 1/2X11 inches, dated 1930 on the back of the sheet, pencil signed lower right, printed on a thin wove type paper. The corners have been rounded, possibly for a former picture frame. It is editioned as 8/20. This is an original pencil signed and titled etching by American regionalist artist John E..Costigan. 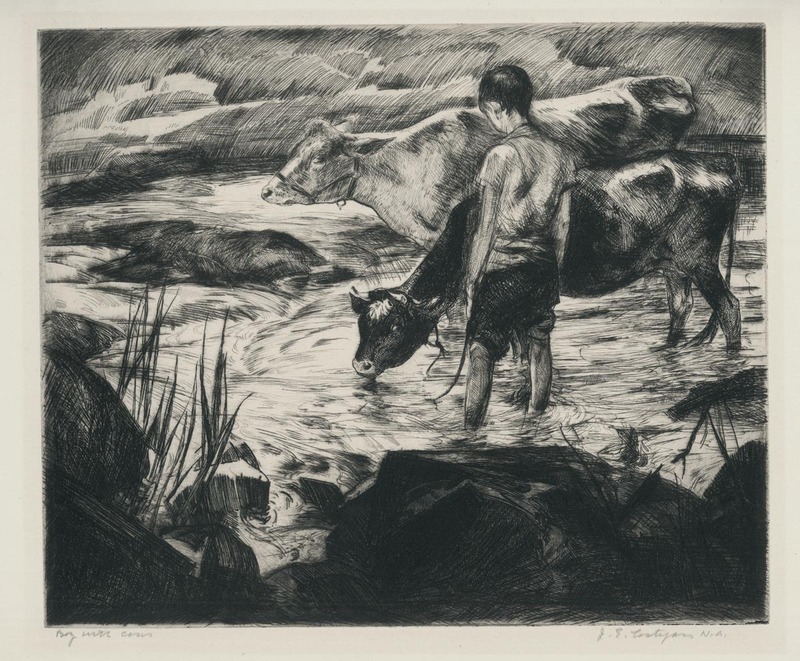 The titled of this work is: "Boy With Cows", it was created and printed in 1942, published by Associated American Artists in New York. The image measures 9 3/8X11 7/8 inches. 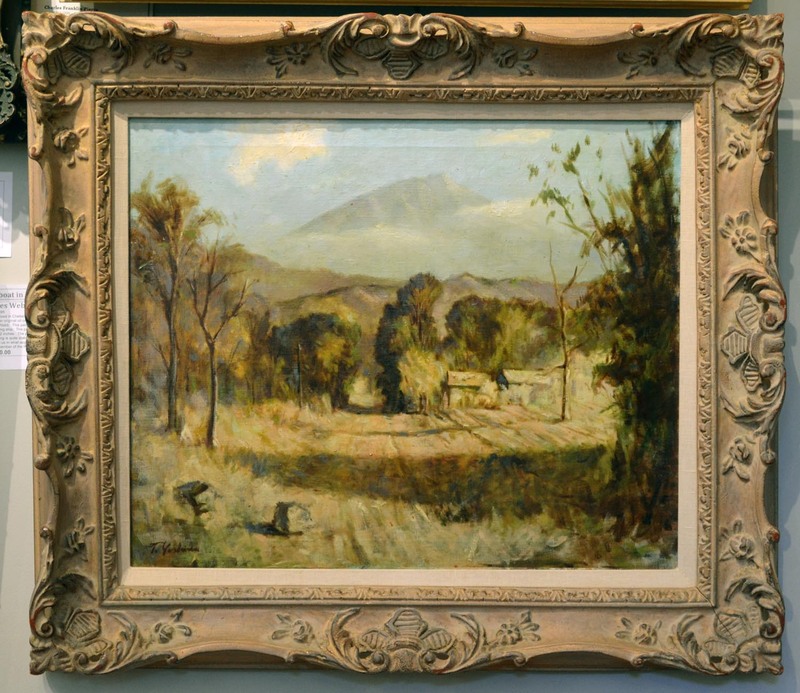 A view of life on his farm, frequently using his family as subjects. 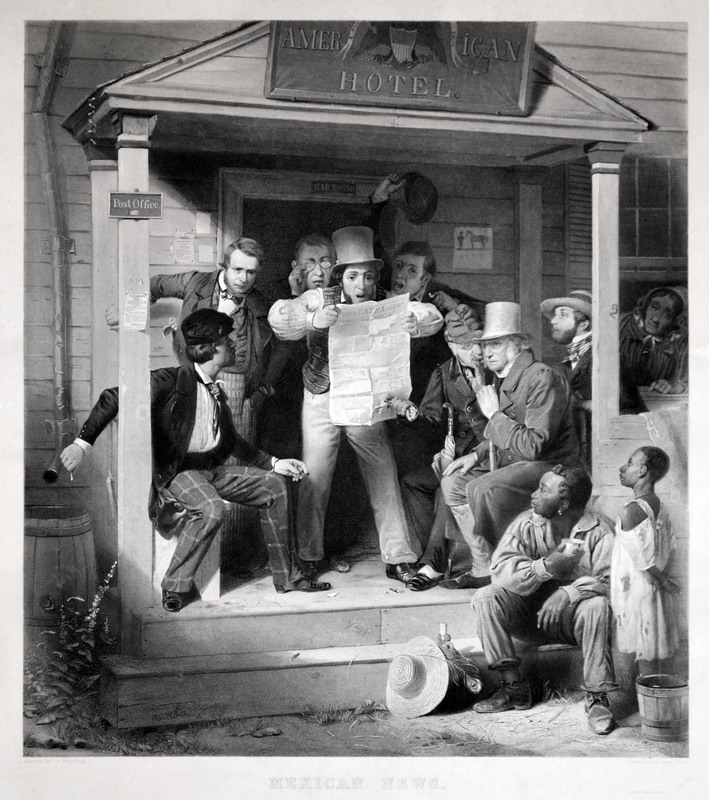 One of his best etchings.